There is no way to see all the highlights of the most dynamic city in the world. There are so many options and so much to discover. NYC is a city of layers – the more one gets into it, the more one sees. First-time visitors must start with the outer layer – the icons. The universal symbol of freedom. Seeing “Lady Liberty,” whether from a distance or up close on a visit to Liberty Island, is a must. The ferry ride to the island plus different tour experiences combined with a visit to Ellis Island can be purchased through Statue Cruises, the sole concessionaire of the National Park Service property. 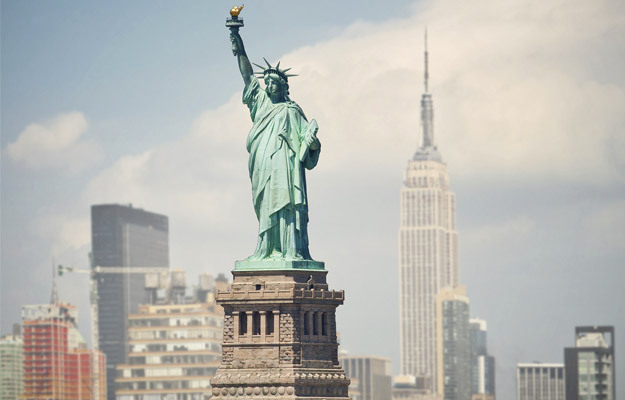 The Statue Cruises ferry departs daily from Battery Park every 30 to 45 minutes from 9am until 3:30pm. Lines build up fast. Get there early, preferably the 9am ferry. On the return trip to Battery Park, the ferry stops at Ellis Island for those interested in exploring the fabled gateway to America for millions of immigrants between 1892 and 1954. Other viewing options include looking at Lady Liberty from Battery Park or from the deck of Circle Line Sightseeing Cruises, a 75-minute narrated tour. It not only gets close to the Statue of Liberty, but also Ellis Island and showcases great views of Manhattan’s skyline. Departing from Pier 83 in Hudson River Park (West 42nd St, & 12th Ave), the cruise is a wonderful way to see Lady Liberty without the crowds plus see highlights around and in Manhattan’s active harbor. The skyscraper dominating midtown Manhattan is more than just a landmark. Getting to the top of the 1931 Art Deco marvel of American architectural ingenuity is a totally memorable experience – from 1,050 feet above the ground, on a clear day, you really can see the entire city. An Empire State Building Observatory ticket will get you to the open-air promenade and glass-enclosed pavilion of the Observatory on the 86th floor. Included in the admission ticket is multimedia tour in several languages which guides visitors through exhibits in the lobby as well as through the panoramic views. The experience is well worth the security check and long lines. 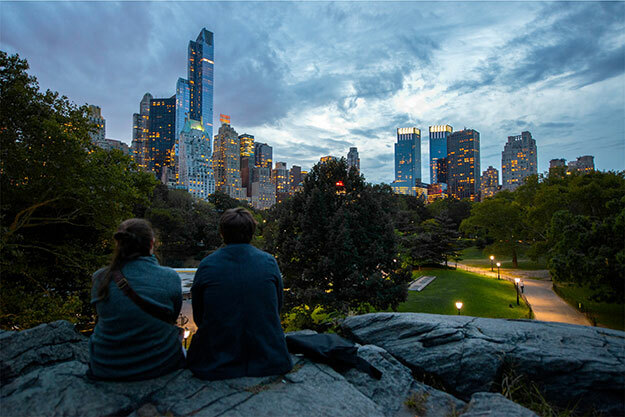 Globally recognized and beloved by New Yorkers, Central Park, an 843-acre swath of green in the heart of Manhattan, is the heart of Manhattan. Framed by skyscrapers, this pastoral oasis of rolling meadows, wooded trails, tranquil lakes, formal gardens, photogenic bridges and arches, statuary, living memorials, skating rinks, outdoor theaters, is at the top of every visitor’s list. Some of New York’s favorite areas are: Strawberry Fields, the living memorial to John Lennon; Cleopatra’s needle; ornamental Belvedere Castle; Delacorte Theater, summertime venue of Shakespeare in the Park. Regardless of the time of year, photo ops are around every bend. Very walkable, there is no way it can be all covered on foot. A great way to see more of it is on the Central Park Bike Tour. It is not only a great exercise, but it’s fun and very interesting, thanks to the knowledge of the guide who knows where all the cool places are and how to get there. The easy 2-hour, 6 mile tour begins at the Tavern on the Green, a landmark in its own right. The ride travels along the loop trail around the entire park. Side trips veer off along interior bike paths connecting must-see places. The pace is steady, with frequent stops to see special features close-up. The Met is one of the world’s largest and finest museums. To be able to see world class art – from ancient to modern – up close is an unparalleled experience. The Met’s global collection of nearly 2 million works of art represents the best of of man’s creativity. Master works from every part of the world, in every medium, from 5,000 years ago to the 20th century are exhibited in beautifully curated galleries. Although only a portion of its massive collection is on exhibit at one time, the depth and breadth of works in its endless galleries is overwhelming. To get the most from a visit to the vast Metropolitan Museum of Art and to avoid total sensory overload, it is important for visitors to decide in advance what they want to see. The American Wing houses the world’s most comprehensive collection of America art and 24 period rooms offer incredible insight into American history and daily life. The Museum’s collection of European paintings – from the masters to Impressionists and Post-impressionists is one of the greatest in the world. The Egyptian collection is the largest outside of Egypt; the Islamic collection one of the world’s finest. Asian art, European sculpture, Renaissance art, antiquities, modern art – in all art forms, the best is here. There’s a lot happening at this plaza encompassing the enormous ice-skating rink, whose opening has come to symbolize the beginning of the Holiday season, NBC studios and the Today show’s live on the plaza, shops and restaurants. It also takes in a series of spectacular Art Deco buildings with bas relief sculptures and indoor and outdoor decks offering stunning panoramas, grounds and gardens, large sculptures and, the Top of the Rock Observation Deck. To experience the 360 degree panoramic views from the 3-tiered observation deck from the top floors of 30 Rock Plaza is a must. Five active, congested, colorful blocks in NYC, stretching from West 42nd to West 47th streets, glow in a cacophony of neon and motion. Always busy, always active, it’s a totally commercial, a bit wacky, fun zone. This is where ABC’s Good Morning America is broadcast live; where the New Year’s Eve ball drops, a phenomenon which attracts wall to wall crowds to Times Square and is viewed by millions around the globe. It’s a place of street performers, people dressed in costumes (super heroes are faves), making money in photo ops in this public theater of the absurd. A-listers are in Madame Tussaud’s Wax Museum; the bizarre at Ripley’s Believe It or Not; fun happens at Discovery Times Square. The largest comic book store in the US, Midtown Comics, is here, plus hundreds of shops compete for over-the-top ways to out-do one another (Toys’R Us has an indoor Ferris wheel!). There are plenty of places to eat and drink – over 100 restaurants and countless bars. It also is home to Broadway, the best theater in the world. 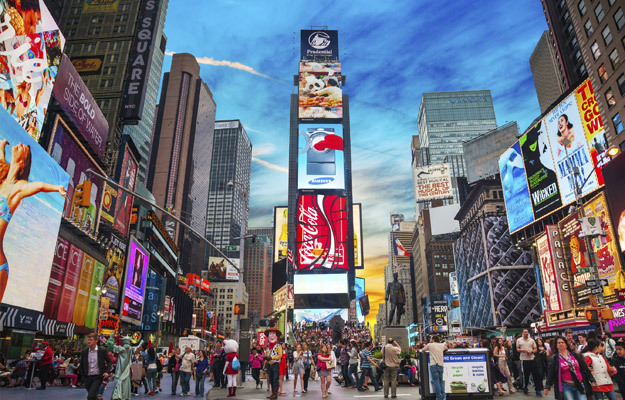 Many people come to NYC for one reason…to see a Broadway show. Along “The Great White Way,” marquees on theater after theater light up the day and the night. Don’t just walk past the theaters, go to a Broadway show. Purchase tickets way in advance for a wonderful NYC experience. If you can’t swing a ticket, go on a theater tour. Broadway Theater District Walking Tour on Wednesdays at 11am only is a 2-hour, 1.5 mile, story and history-filled walk through the legendary Theater District, past famous theaters where great performances continue to be delivered by great artists with a host of talented people behind the scenes. It’s a fascinating glimpse into one of the key reasons there is only one NYC. A day seared in America’s collective memory and spirit. The 9/11 Memorial, built on the site of the Twin Towers, is a place of tribute. 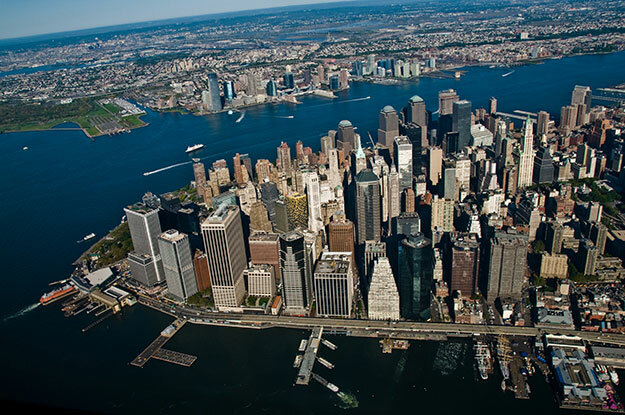 Visitors to NYC are drawn to it, compelled to just be there, to see, to contemplate, to honor. Profoundly moving, the Memorial and Museum sear the reality of the seismic shift in global dynamics in every visitor’s mind. Standing in the large empty space among skyscrapers, a hole is felt in the human spirit. In its simplicity and symbolism, the Memorial holds a powerful weight. A place of remembrance and quiet reflection, it is both a tribute to the past and a place of hope for the future. Multiple interesting and moving exhibits, films, tours and programs are inside the Museum adjacent to the Memorial honor the lost while focusing on rebirth through knowledge and understanding. Time specific tickets are required to enter the Museum. 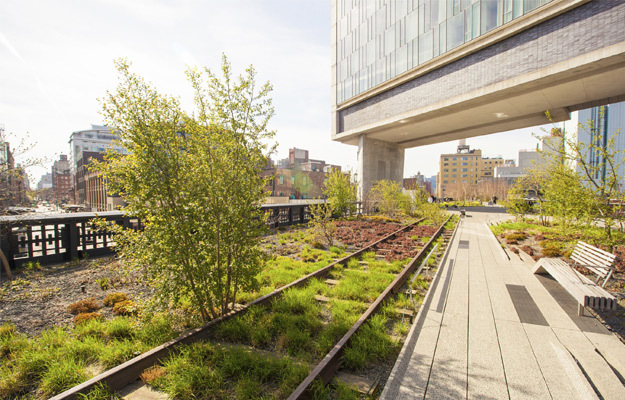 The 1 ½ mile long elevated landscaped park, 30 feet over the street set on an abandoned rail track stretching over three of the city’s most unique, recently gentrified neighborhoods: the Meatpacking District, West Chelsea and Hell’s Kitchen, is a uniquely NYC experience. The views of the city skyline and the Hudson River are phenomenal. Even the Statue of Liberty at the end of Lower Manhattan is visible from the High Line! A well maintained green space, landscaped with flowering plants, bushes, grasses and trees, changing public art installations, benches, food vendors and occasional music, it’s a wonderful break from the action of the 24/7 city down below, To be part of the city, but out of it, is really cool! Fifth Avenue = shopping and high-end stores. It’s a broad avenue, lined with the flagship stores of the best department stores and storefronts of the finest high-end designer stores. Side by side high end, old-line stores are more reasonably priced stores found in malls throughout the US. Shop till you drop or just enjoy looking at the amazing window displays. Both are reason enough to stroll down Fifth Avenue. In the middle of all this glamour, standing serenely in ecclesiastical grace and Gothic beauty is St. Patrick’s Cathedral. Walk inside. Spend at least a half hour walking through it. It’s lovely.